A review of historical posting data reveals that posting activity on Wittenberg has dropped off significantly over the past several months. 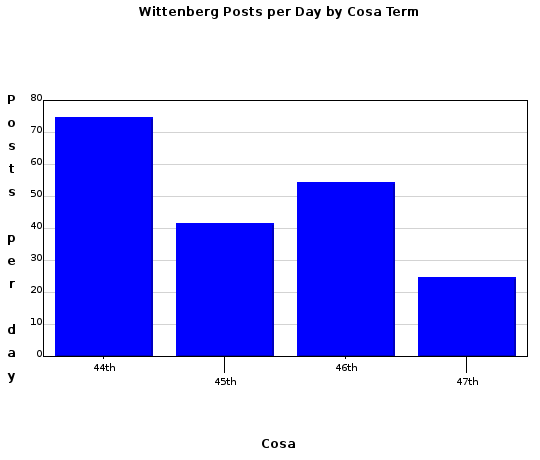 Since the start of the 47th Cosa on 1 October 2014, Wittenberg has experienced approximately 24.6 posts per day. This compares to 54.4 posts per day during the 46th Cosa, 41.7 posts per day during the 45th Cosa, and 74.7 posts per day during the 44th Cosa. As can be seen from the figures on the right (and the graph[s] accompanying this article), the posting level on Witt was astonishingly high during the 44th Cosa in 2012-2013, fell significantly during the 45th Cosa in 2013-2014, recovered somewhat during the 46th Cosa in 2014, and fell precipitously during the 47th Cosa. 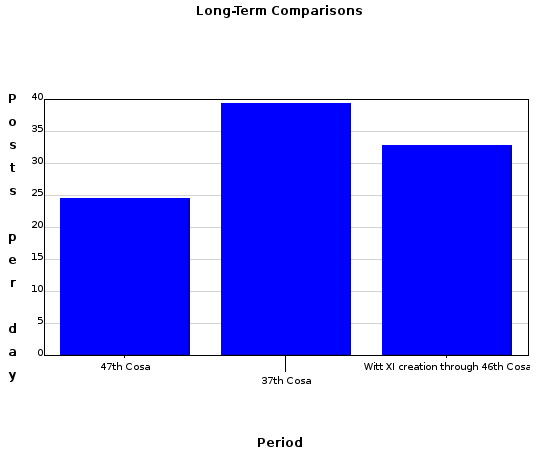 Put another way, the activity level on Witt was approximately 120% higher during the 46th Cosa than it is now, 70% higher during the 45th Cosa, and 200% higher during the 44th Cosa. The recent decline in Witt activity is also significant from a longer-term historical perspective. The average posting rate from the creation of Wittenberg in 2004 to the beginning of the current term was 32.8 posts per day, or 33% higher than the current rate of 24.6 posts per day. It also appears that the posting rate during the 37th Cosa, in 2007-2008, was approximately 60% higher than the 47th Cosa to date. And that was with a voting age population that was only about 40-47% of what it is today. (Note that this means that when population is taken into account, the per capita posting rate on Witt was higher during the 37th Cosa than in all three of the most recent terms--the 44th Cosa’s per capita rate appears to have been slightly higher than in the 37th). One might question whether the posting figures from the 47th Cosa to date are skewed by the fact that they represent less than a full Cosa term or less than a full calendar year. For example, it may be that posting levels tend to be higher during elections than during the initial months of a Cosa term, or that posting levels tend to be lower during the winter. 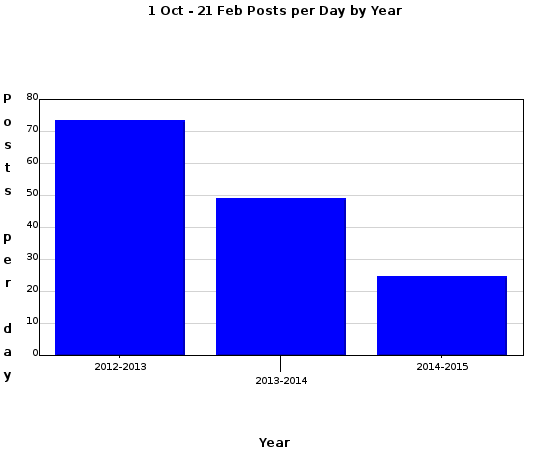 The 47th Cosa posting rate of 24.6 posts per day is based only on the first 143 days of the term, from 1 October 2014 through 21 February 2015. The election cycle does not appear to explain the decline. In all three previous Cosas, the average posting rate was slightly higher during the first 143 days of the term than during the remainder of the term. Neither does seasonal variation appear to be a factor, considering the average posting rate from 1 October through 21 February during the two previous comparable periods (2012-2013 and 2013-2014). The 2012-2013 period fell entirely within the 44th Cosa, and was slightly (less than 2 percent) below the overall average for that term, and the 2013-2014 period straddled the 45th and 46th Cosas and was in between the averages for those terms (49.1 posts per day versus 41.7 and 54.4). For those whose minds turn immediately to partisan considerations, the dropoff also does not appear to be related in any simple and direct way to party control of the Cosa, as the posting rate during the last RUMP-controlled Cosa (the 45th) was lower than during the the first Cosa controlled by an MRPT-led coalition (the 46th). For now, the reasons for the recent decline in posting activity on Wittenberg are unclear, but further research and analysis may provide clues. But we can hypothesise a number of possible explanations. First, it may be that Talossans are switching from posting on Wittenberg to other forms of active participation in Talossan life. Second, it may be that most citizens are simply less active in Talossa than was historically the case. Third, it may be that many of the citizens who were most active during recent terms have recently cut back on their Talossan activity, and the newer generation of immigrants has not produced the same kind of hyper-active citizens to make up for that loss. It seems likely that the true explanation involves some combination of all of these factors, and possibly others as well.